U.S. Patent No. 8,255,323 for "Motion based payment confirmation" may seem innocuous at first glance, but the invention could very well be implemented into an NFC-driven mobile payment solution. 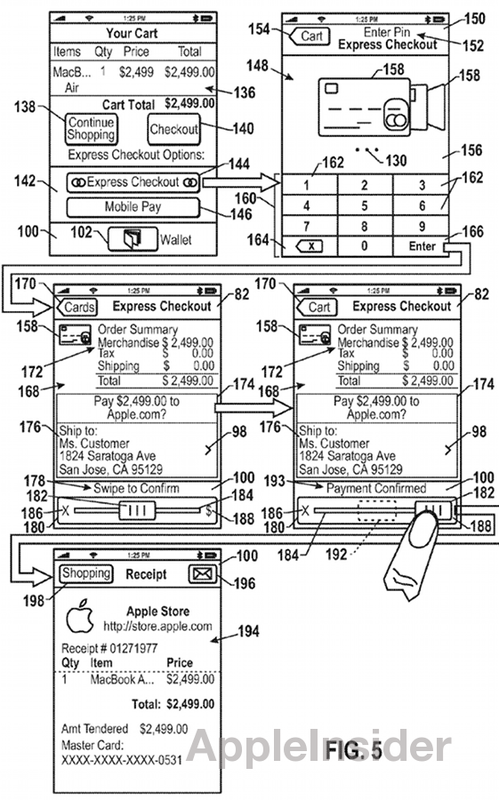 The '323 patent basically describes a graphical user interface for payments made on a mobile device, however the claims and embodiments strongly hint that it could be part of a comprehensive transaction system. In one embodiment, an electronic device may include a graphical user interface (GUI) with one or more graphical elements that may be moved by a user to confirm or decline a payment transaction using a selected payment instrument. The GUI operates on multi-touch gestures and input from a device's various sensors, such as the accelerometer. So-called "movable graphical elements" are used both to signal a user's intent to buy and give confirmation that a transaction has been completed. For example, a user can select type of payment, possibly represented by a credit card or debit card graphic, and slide the element to a "confirmation position" to make a purchase. Another embodiment allows a user to move the device itself to complete a transaction. The solution is arguably safer and more elegant than simply pressing an "OK" or "Buy" button. While the description appears banal, the accompanying embodiment examples specifically point to NFC technology as a possible basis for said payments. Close range communication with the NFC device may take place via magnetic field induction, allowing the NFC device to communicate with other NFC devices or to retrieve information from tags having radio frequency identification (RFID) circuitry. As discussed below, the NFC device may provide a manner of connecting to a shopping website and communicating with an external server. 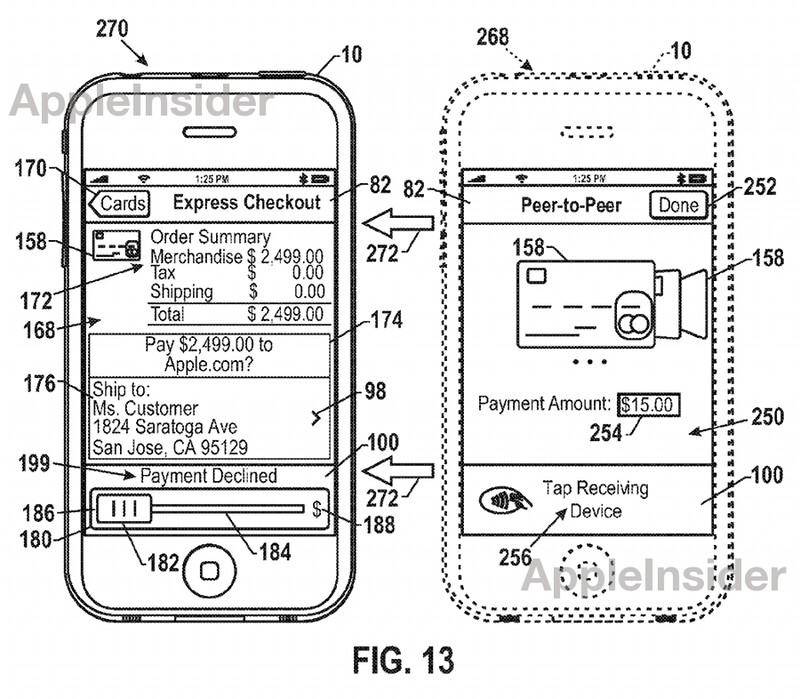 Apple does not yet have a mobile payment system that includes NFC technology, however the company's iOS 6 will include the Passbook app which is akin to a limited version of an eWallet. At launch, the program will be able to carry digital versions of tickets, store membership cards, and airplane boarding passes, but is not expected to support credit cards or other forms of electronic payment. For example, credit cards may be digitally represented within an electronic wallet or an online payment system. 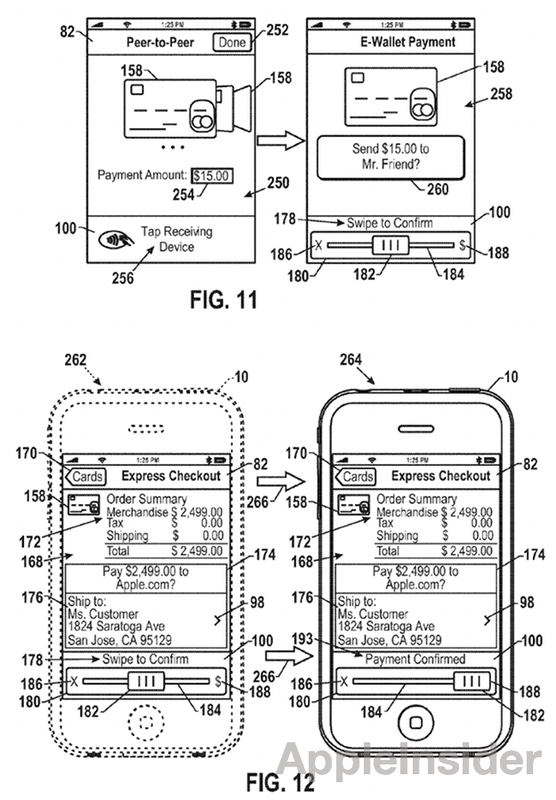 After movement of the graphical elements, the electronic device may transmit a confirmation message to initiate payment with the selected payment instrument. The iPhone maker is rumored to be investigating NFC payment systems, but its intentions remain somewhat nebulous. Most recently, photos were published of the alleged next-generation iPhone's front assembly, appearing to show the incorporation of a mystery component some believe to be an NFC module.